This page shows some pictures of Venus. Although Venus is small it is bright and the moon-like phases can be seen clearly. Click the images to see full-sized ones. NEW! Venus transit of 8 June 2004. Click HERE to see pictures. 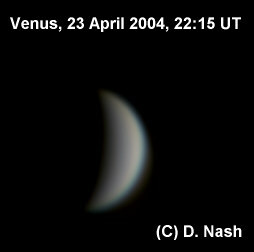 22 May, 2004 The day when Venus transits the sun is close now (a little over 2 weeks) and the planet is fast approaching the sun, making it difficult to capture before it disappears into the twilight. 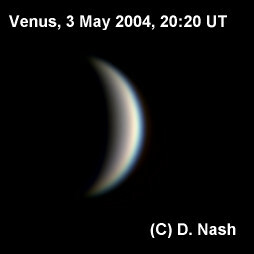 This picture was captured as Venus sank lower in the west before it was dark. 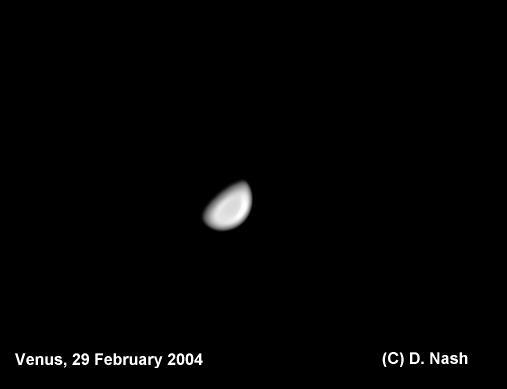 The crescent is clearly very large and much thinner. .
3 May, 2004 For this image I captured 1700 images and stacked the best 60% in K3CCDTools 2, using the Planetary Wizard in fully automatic mode. 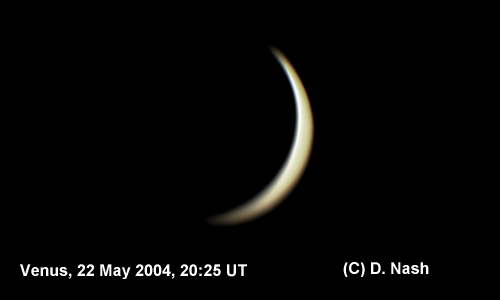 The results are good and show the increasing crescent -- only just over a month before Venus reaches the sun, as seen from Earth, on 8 June. Camera settings: 10 fps, gamma 0, saturation mid, brightness mid, Shutter 1/500s, Gain 15%, white balance fixed. 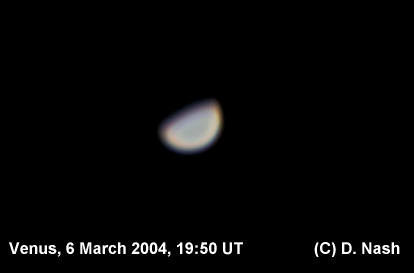 24 April 2004 As the distance between Earth and Venus is decreasing, it is staying in view later in the evening, it's apparent size and brightness are getting larger, and the crescent increases. 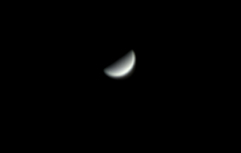 This photo, processed with K3CCDTools 2 and the Gimp, shows this clearly -- compare with the previous ones, all taken using the same equipment and processed in similar (albeit not exactly the same) ways. 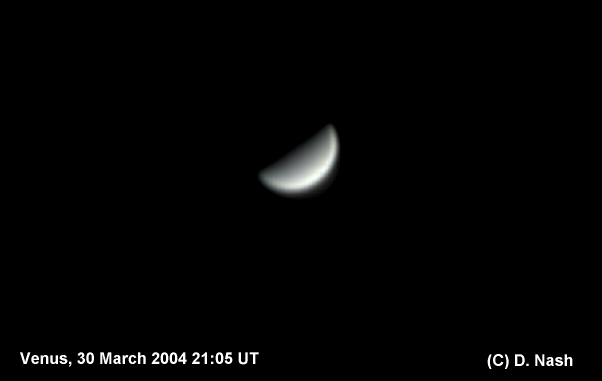 30 March 2004 Here the crescent phase of venus is becoming clearer. Over the next few weeks it should become more and more noticable. 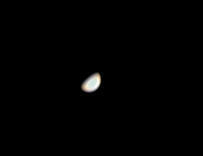 6 March 2004 This image was captured with the ToUCam at 10fps, brightness 30%, gamma 40%, saturation 50%, shutter 1/100, gain 0. best 30% of 587 frames stacked in K3CCDTools planetary wizard, then adjusted with Registax2 and the GIMP. 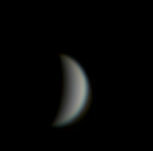 29 Feb 2004: Venus Aligned/Stacked in K3CCDTools, processed in Registax 2 and the GIMP.